Kim Park Gregg became part of Korea's global transfer of children as a seven-month-old baby. She was raised in St. Paul, Minnesota, by liberal white parents who she says preferred adoption as a way to create a family. Now a graduate student in American Studies, Park Gregg is researching how adopted children were affected by growing up in white homes. "Every single person who I've talked to does have something to say about being a person of color in the United States and what it's been for them to grow up as they only person of color, the only Asian person in their town-unless there's one other adoptee that's like their sibling!" says Park Gregg. "And I think it's been a really important factor for a lot of adoptees." Park Gregg says research on adoption has largely been done by and for adoptive parents to help them raise their children. 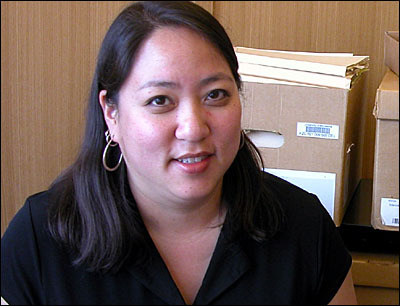 She's part of a vanguard of researchers trying to see things from the adoptee's perspective. To understand what parents like hers were told about their children and to understand why Korea became the major source of children, she visits the Social Welfare History Archive at the University of Minnesota. It's a treasure trove for people who want to understand the secretive world of adoption. "There were a number of things that I found in these records that were really hard for me," says Park Gregg. She turns carbon copies in the thick files, stopping to read some aloud that have particularly struck her. There are descriptions of planeloads of children leaving Korea in the 1950s to be adopted by people who had never met them. The parents-to-be weren't screened by anybody more than the family minister. Park Gregg says while she's relieved that many of these practices had changed by the time she was adopted in the early 1970s, she wonders, "How could this have happened?" 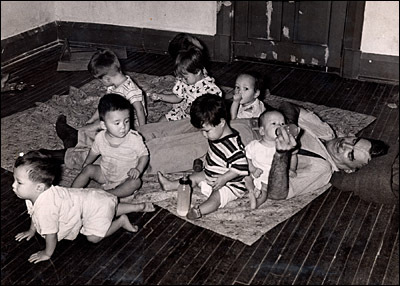 Harry Holt caring for seven of the eight children in Korea. Summer 1955. Park Gregg zeroes in on a huge set of files concerning a man named Harry Holt. "There's some really juicy stuff in those," she says. Harry Holt was a retired farmer and evangelical Christian from Cresswell, Ore. When he and his wife, Bertha, learned that the mixed race sons and daughters of American and British soldiers in post-war Korea were starving, abandoned and bullied in the streets, they felt called by God to help them. The Holts got a special act of Congress passed in 1955 to allow them to adopt eight children, six more than the law would have allowed. Much of the glory and controversy in the early days of Korean adoption would center on Harry Holt. Park Gregg points to stacks of press clippings showing Harry Holt getting off an airplane with the 12 orphans he brought back in October of 1955. Eight would join his family and four would go to other Americans. After Holt's high-profile adoptions, he was flooded with requests from other families. In her memoir, Bertha Holt writes that visitors constantly showed up at their home in Oregon to talk with her husband about how they could adopt a child. She writes, "Harry could never say 'no' to any of these visitors because he could not forget the tiny outstretched arms of the children still in Korea. He continued to adopt children and bring them back by the planeload to other Christian families waiting back home.